I can't believe it's the end of August. Last time we sat down for tea it was the beginning of summer and the prospects seemed endless. Not that September is a bad time at all; I love my job and returning to school will be great. But it does tend to cut into my crafting/travelling/going out time. Sorry, I've started talking already and I haven't even offered you tea. How does vanilla sound? The box says you shouldn't take it with milk, but that seems a bit daft to me. I think the milk takes the bitter edge off the tea and lets the sweet vanilla sing through. Which is a long way of saying trust me: it's yummy! It's nice to look back over summer though with a sense of having embraced life. There was the first week of frantically organising last minute things for my Cambodia trip and then three weeks experiencing another culture; meeting wonderful girls and leaders and sharing our love of Guiding. But I've talked enough about that, and will continue to talk about it a lot more so perhaps I'll tell myself to stop there on that topic! Then there was the catching-up week when I got back. There was admin to do and reports to write; photos to edit and the scrapbook ideas to organise, friends, boyfriend and family to see and jet-lag to conquer. And now it's the last week. It's been a beautiful bank holiday; meals outside, outdoor theatre and drinks by the river. This is the stuff bank holidays should be made of and almost never are. But the sunshine was on our side this time! And I fully intend to squash as much into this last week as possible. To try out new projects and learn new things and exploit this last free week and embrace the feeling of expectation September brings. I'd love to hear about your summer too. It's lovely to hear what people get up to when the weather turns pretty and anything seems possible. I'm sorry this has been such a brief chat; I have lots of plans for the rest of the day! I hope that it will involve cake pops, blueberry gin, blogging and my continued adventures into blog design (slow going! ), a spot of shopping for crafty bits and pieces, lunch out and if I'm lucky, a theatre ticket. I'm trying to get a ticket to see Book of Mormon. It's sold out but if you turn up on the day, you can take part in the ticket lottery and win one of 20 tickets for £20. I've not been successful yet, but maybe today will be my day? 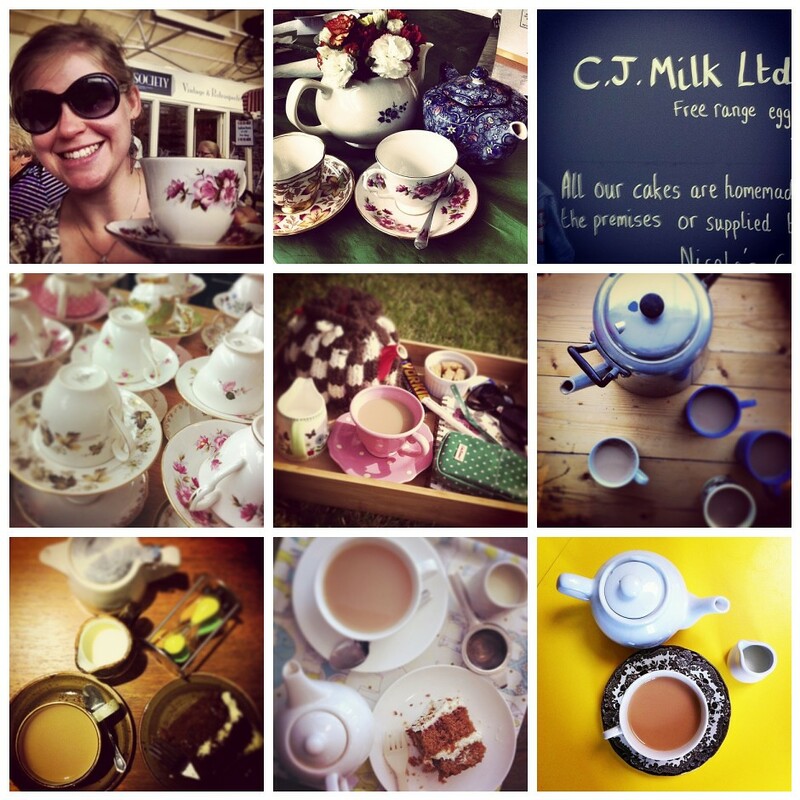 Why not have a spot of tea with Abi over at Creating Paper Dreams? It's time for tea with her too, and many other bloggers will gather to share their teapots and adventures. P.S. I am learning to use Instagram to get better iPhone pictures. I have a love-hate relationship with the iPhone camera as it has nothing like the flexibility of my beloved dSLR. However, I do always have it with me, and so I'm making a conscious effort to embrace its limitations and use it. I know people can produce wonderful images with these little cameras and I suppose like anything else, I need to learn to get the most out of it. Anyway, those pictures are some of the cups of tea I have enjoyed over the last couple of months. Hello. What a lovely cup of tea that was. Vanilla tea was such a treat. Love the look of your blog too. I've just redone mine too and am definitely not an expert but have learnt a lot so any questions feel free to get in touch! I like your iphone photos. I agree the camera takes a bit of getting used to. Have you tried the camera+ app. You can set focus and exposure and it even shows you what f stop you are using. Never had Vanilla tea before so thank you for the introduction! You've certainly packed more into your school holidays than I have; how quickly those weeks seem to go.